For B6-B7 S4 and B7 A4 with the 6HP19 6-speed Tiptronic transmission only. NOTE: All B6-B7 S4s and All B7 A4s with a 6-speed Tiptronic transmission are equipped with the 6HP19 by ZF and have this center differential. The factory Torsen center differential in the S4 and A4 provides a 2:1 torque distribution between front and rear wheels. What does this mean? This enables the end of the car that still has traction (most of the time the rear) to deliver double the torque to the tires with the most traction. JHM's experience has found that this closer to even distribution is best for drag racing. If you are primarily into drag racing, this modification is not for you. However for Auto-Crossers, Road Racers, and others who prefer the twisties, JHM recommends a high-bias ratio of 4:1. This is the same bias ratio that Audi has provided in the stock RS4 driveline. So if you are tired of going through corners while using a lot of throttle and still getting "understeer" then this product is for you. It will help you get a little more "oversteer" and allow you to drive the car a little more like a rear wheel drive car but still have the superior control of Audi's legendary quattro all wheel drive system. For B6-B7 S4 and B7 A4 with the 6HP19 6-speed Tiptronic transmission only. NOTE: All B6-B7 S4s and All B7 A4s with a 6-speed Tiptronic tramission are equipped with the 6HP19 by ZF and have this center differential. There is a core charge if we send out a JHM center differential to you (see drop box below for amount). When you exchange your center differential for a JHM unit, send your differential back to JHM and we will refund the core charge. As of 7-23-1 we currently have only a couple tiptronic cores in circulation since this is a new product and it takes time to locate them. As a result we are offering a $75 discount when sending yours in to be modified. Once we locate and stock up on cores this promotional price will end. NOTE: If your core is damaged or worn out your core fee will not be returned or only partially returned. However if you have a damaged center differential contact us and we can discuss your options. You may also send your differential to us for modification and not incur a core charge. 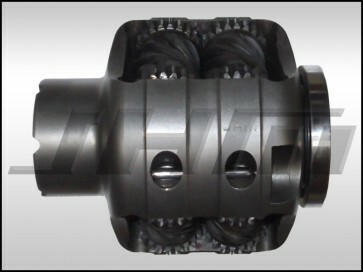 We can usually modify and ship out your differential within the same day. If you will be sending yours in, select the option from the dropdown below and specify in the comments that you will be shipping it in. When shipping your differential in for modification, please include a copy of your invoice that you receive via email after you place your order. Also, put the invoice number from your order on your box when shipping it in for modification. NOTE: It is common with this modification to notice a slight chatter when making u-turns at low speeds. This is due to the changes from the modification that make it bias differently under power and at high speeds. During normal daily driving, this chatter is not noticeable. This is the first mod an B6 owner should do to their car. It completely transforms the car in the twisties. While it doesn't get rid of all the understeer, it's very nearly perfection.